With the launch of the new TM1700 range of circuit breaker analysers from Megger, users with regular circuit breaker testing requirements no longer have to choose between low-end instruments designed only for simple applications and versatile but costly high-end instruments. Four standard models. Full stand-alone functionality or data acquisition models without user interface. 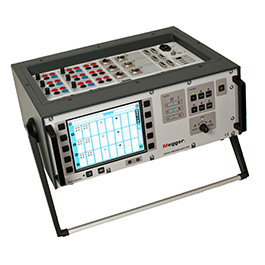 Drawing on its wide experience of circuit breaker testing, Megger has developed TM1700 instruments to offer the most useful and widely used features of high-end analysers at a very attractive price. The technology used in the new instruments is based on Megger's popular and proven high-end TM1800 series, which remains the most attractive option for users who need the ultimate in circuit breaker testing flexibility. Among the many key features inherited by the new TM1700 range of instruments is DualGround testing, which means that tests can be performed with both sides of the breaker grounded. This greatly increases operator safety by eliminating the risk of high voltages being induced into the breaker under test. TM1700 instruments also incorporate active interference suppression, which means that they consistently deliver accurate and dependable results, including measurements of PIR values, even in electrically noisy environments such as electricity substations. A further important benefit is that all inputs and outputs are galvanically isolated, making it possible to perform all relevant measurements in one test without the need to change connections. The new instruments are available in four versions, allowing users to choose the specification that best matches their requirements as well as between standalone and PC-controlled units. Standalone models incorporate a large colour touchscreen and offer an intuitive user interface backed by software wizards that simplify the production of custom test templates. Computer-controlled models are supplied with a PC-compatible software package that provides comparable functionality. To complement its new TM1700 circuit breaker analysers, Megger offers a comprehensive range of accessories. As well as motion transducers , transducer mounting kits, and Static Dynamic Resistance Measurement (SDRM) kits, these include clamp-on CTs that allow the instruments to perform comprehensive first-trip testing, with full analysis of coil current signatures, whether the breaker has a single operating mechanism or separate operating mechanisms for each phase.